It’s Annoying, Unsightly And Can Be Unhealthy. Here's What You Need To Know About Mold. This web page only serves as an introduction to mold. There are resources available online and in your community that can tell you more. We thought the best way to help you understand mold, is to answer a few, basic questions. Molds are the most common form of fungi on Earth, growing both indoors and outdoors. Mildew is also a type of fungus and is usually whitish. Mold and mildew are often used interchangeably. Molds can grow on all types of surfaces. Mold can grow on tile, grout, wood, paper, carpet, drywall, ceiling tile, plastic, insulation, upholstery, ductwork, paint, wallpaper, and more. Molds need water (or moisture), oxygen, and a food source to grow and can reproduce in a little as 48 hours. The key to mold control is to remove its source. In many cases you should be able to see the mold growth and smell a musty odor that is caused by mold. When checking for mold, look for signs of water damage. Wet spots, staining, dampness or other evidence of water leaks or damage may be a precursor to mold growth. In some cases you may not be able to see the mold in your house. Mold may grow behind walls, above ceilings, under carpets and other places not visible to your eye. You may, however, be able to smell it because many molds emit a “musty” smell. If you have a musty smell, look for mold and clean the area if you find mold growing in your home. How can I remove mold stains? 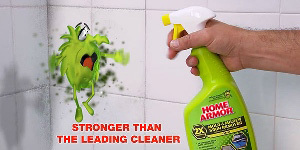 Clean mold stains using one of the Home Armor cleaning products and fix the water problem. If you clean up the mold stains, but don't fix the water problem, then, most likely, the mold problem will come back. While soap and water can clean the area, a bleach-based formula is still the preferred way to remove mold stains because it cleans and decolorizes the stain. This is true for all types of surfaces, both indoors and outdoors. Home Armor offers you powerful products for indoors and outdoors, on all types of surfaces. A mold blocker can inhibit the growth of mold for weeks after you clean. A mold blocker creates an invisible barrier to inhibit the growth of new mold. If mold is prevented from growing then you’ll spend less time cleaning and there is less potential damage to your home. Check out our Mold Armor Mold Blocker product. Chances are you have additional questions. A:Molds are forms of fungus. They are microscopic organisms that are found naturally in the environment and live on plant and animal matter. Molds are very common, and play a key role in nature as they breakdown dead material and recycle nutrients in the environment. Molds can be found just about everywhere, and they grow almost anywhere — including on walls, floors, ceilings, fabrics, and your personal possessions. Q: Why does mold grow? A:Mold reproduces by creating spores, which are released into the environment. There are several factors to mold growth, but they key one is moisture. When mold spores land on a wet or damp surface, they can start growing and multiplying. Whether it's humidity, condensation from a pipe, rain or floods, all of these contribute to mold growth. Add in an organic surface (ceiling tiles, drywall, etc. ), and warmth, and you get mold growth. Just remember, any wet surface that is not dried promptly can grow mold. Q: How does mold enter my home? A:Microscopic mold spores are invisible to the naked eye and enter your home on your skin, clothing, shoes, even shopping bags; they're very adaptable. These tiny spores can float through the air and come in through open doors and windows, or through your home's heating and air conditioning systems. A: Microscopic mold spores can enter your home on your skin, clothing, shoes, even shopping bags, and they’re very adaptable. They can come in through open doors and windows, or through your home’s heating and air conditioning systems. Once they enter, chances are, they’ll find a place to settle, and grow. Q: Where can mold grow in my home? Of course, mold will also grow on your outdoor surfaces — wood decks, patios, patio furniture, brick, stucco, roof shingles. Basically anywhere on your property. Q: What conditions foster mold growth? A: Mold likes temperatures ranging between 40° and 100° Fahrenheit. Combine that temperature with floods, leaking roofs, plumbing leaks, bathroom and kitchen steam, poor ventilation, leaking windows, humidifiers, and wet clothes, and mold can grow quickly. Q: Can mold present health problems for my family? A:As with ridding your home of mold, controlling moisture is a good place to start. Clean and vacuum your home regularly. You'll find it in our Mold Blocker product. It can provide you with up to 3 months of protection against mold growth. Q: Where can I find more information on mold? 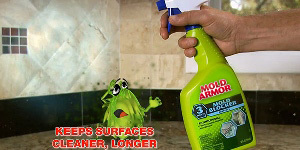 In the meantime, we invite you to examine the wide array of Mold Armor mold stain removing products. You won’t find better, more powerful or more convenient ways to clean up mold stains. Mold Armor. Stronger Products, Guaranteed.